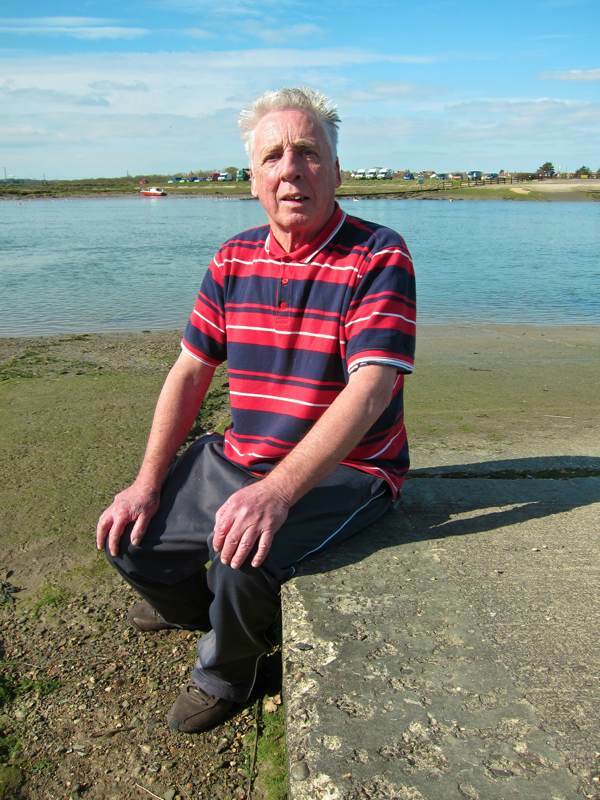 Colin Ross has always been drawn to the river, though now it is the River Crouch at Hullbridge in Essex where he lives in retirement, rather than the Thames where once he and three generations of men in his family before him worked as dockers at the Royal London Dock. With his sharp bird-like features, deeply lined face, strong jaw and shock of white hair, Colin is an imposing figure with natural dignity and an open sociable manner. Above all, you sense a generosity of spirit. It is an heroic attribute in one who fought the long battles that Colin did – battles which proved to be unwinnable – to keep the docks alive and keep his fellow dockers in employment there. Living modestly with his wife in an immaculately-kept mobile home surrounded by a small garden close to the River Crouch in Essex, Colin has found a peaceful haven and no longer comes up to London very often, but he was eager to speak to me of the conflicts surrounding the closure of the docks in which he fought with such courage and presence of mind. “The Royal London Group of Docks was the largest enclosed docks in the world and I was the fourth generation of my family to work there – before me there was Tom, Jack and Archie, who came down from Scotland. My grandfather Jack was involved in the first great dock strike of 1889 that led to the foundation on the TGWU. The East End was absolute poverty then and the strike went on and on. Money was sent from all over the world to support the dockers. Randolph Hearst sent money, and in the end it was the intervention of the Catholic church and Cardinal Manning personally that got the ship owners to the negotiating table. My nan’s brother – his family were so destitute that his wife sold her body to make money and, when he found out after the strike, he killed her. I joined the docks in 1965 at the age of twenty. At sixteen, I went to sea but if your dad was a docker it was expected you would work in the docks, and my dad’s reputation went before me. When you went to work, you earned good money – but most of the time you didn’t get to go to work. Jack Dash – the legendary union man – took me on one side to recruit me as union leader and said, “Son, there’s three people you want to avoid in life, ship owners, insurance agents and bankers.” I don’t think he was far off there. People don’t realise the battles we had in our struggle to keep the docks open. We saw that containerisation was coming and we realised it was going to mash the East End to bits. There were 27,000 regulated dock workers and for every one of them another two workers dependent on the docks. 100,000 people relied on the docks for a living. We negotiated with the Port of London Authority and they said, “It’s no good standing in the way of progress.” But what’s the good of progress if it doesn’t benefit everyone? Our argument was – You have the docks in place and the rail links and the workforce, why can’t containerisation be done in the docks? Gradually, they weakened our cause with increased offers of severance pay and then, before we knew it, the asset strippers moved into the Royal London Docks – only they called them Venture Capitalists, they bought up the docks, closed them down and sold them as flats at half a million pounds each. When I went into the docks, Charles Dickens would have recognised it. It was that antiquated because the ship owners never spent a penny on it. I thought, “Something’s wrong here,” because the shipping companies belong to the richest people in the country, and the wages were so low they could afford to keep 2,000 paid dockers in reserve to cover for the holiday period. It was the industry with the highest level of accidents in the country and you got no sick pay. The mortality rate was high and dockers did not expect to live beyond fifty-eight to sixty on average – this was in the nineteen sixties. We never realised they were going to close down the docks until we met some American longshore men and they had experienced the same thing. But in America the union was so strong because it was run by the mafia, they got a deal we would die for. I went to Jack Jones at the TGWU and said “Can’t you see what’s happening?” We formed our own unofficial committee, the National Port Shop Stewards’ Committee. The problem was the same in Liverpool, Hull and Southampton and we decided to hold dock gate meetings. We picketed dock gates in London, saying to lorry drivers they would be blacklisted in every dock in the country if they crossed our picket line, and it was a roaring success. Ted Heath was Prime Minister at the time and they threatened to put us in prison, but they realised if they arrested us there would be carnage. 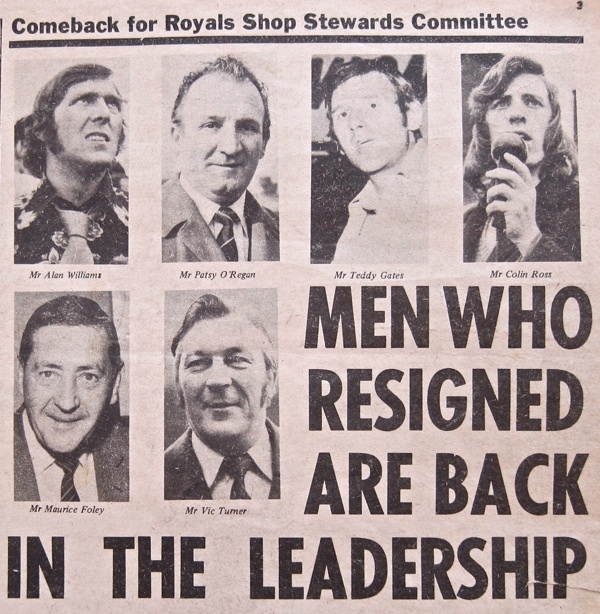 In 1978, Colin Ross left the docks. He went to work at a container plant in Purfleet and his wages increased from £30 to £350 a week, but he found there was no camaraderie as he had known at the docks in the East End. Within two years, Colin left to run a fruit and vegetable at Globe Town Market Sq in the Roman Rd for the rest of his working life. “It was the saddest day of my life,” was how he described leaving dock work, after his personal history of struggle and the struggle of three generations behind him. 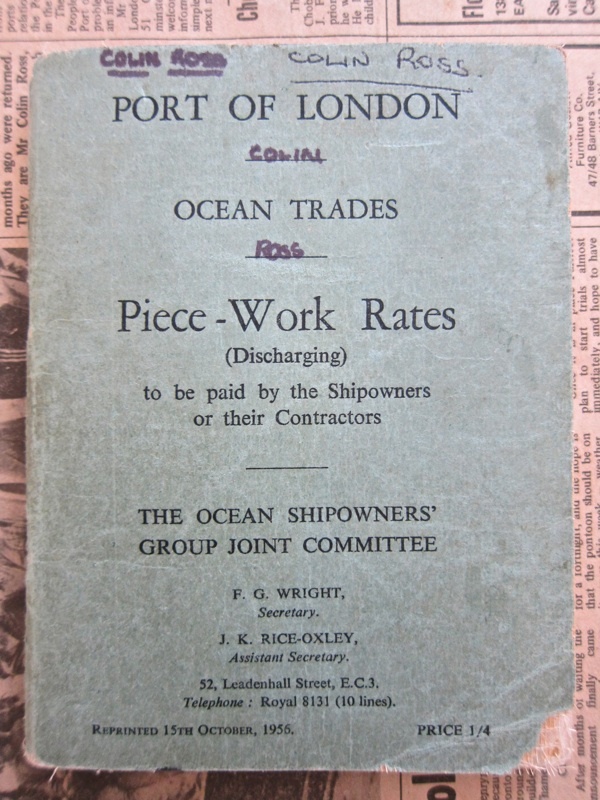 The London Docks were closed by shipowners who wanted to move to new container ports as a means to break the unions and introduce casual labour, and make short-term profits by selling off their warehouse spaces. Yet the final irony lies with Colin, because anyone who has travelled upon the Thames – the silent highway, as they once called it – recognises the absurdity of the empty river when it is the obvious conduit for transport of goods as the roads grow ever more overcrowded. River transport linked to rail would be a much greener and more efficient option in the long term than the container ports and haulage trucks we are now forced to rely upon. With remarkable foresight, Colin saw all this forty years ago and he fought his best fight to stop it happening. So although he may be disappointed his spirit is intact – and his story is an important one to remember today. 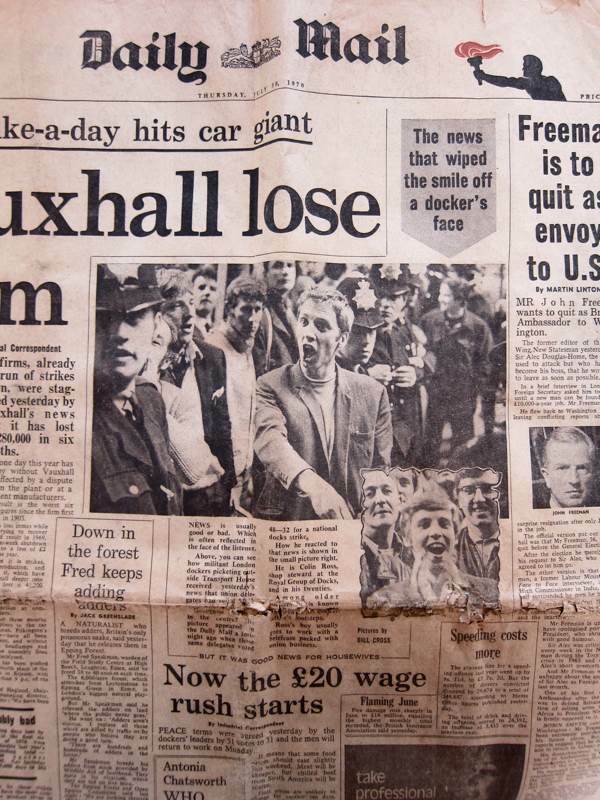 Colin made the front page of the Daily Mail in 1970. 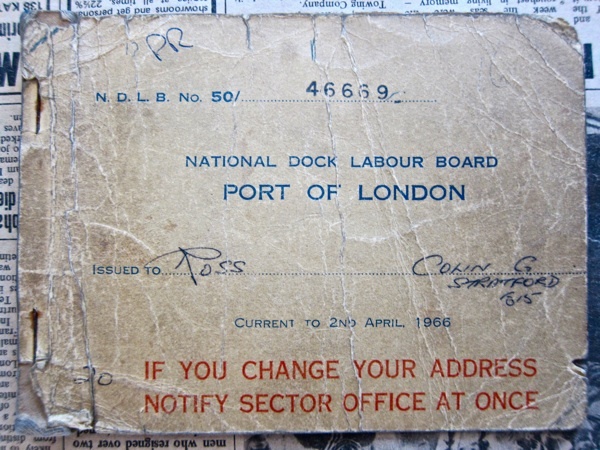 Colin’s pass book issued by the National Dock Labour Board. 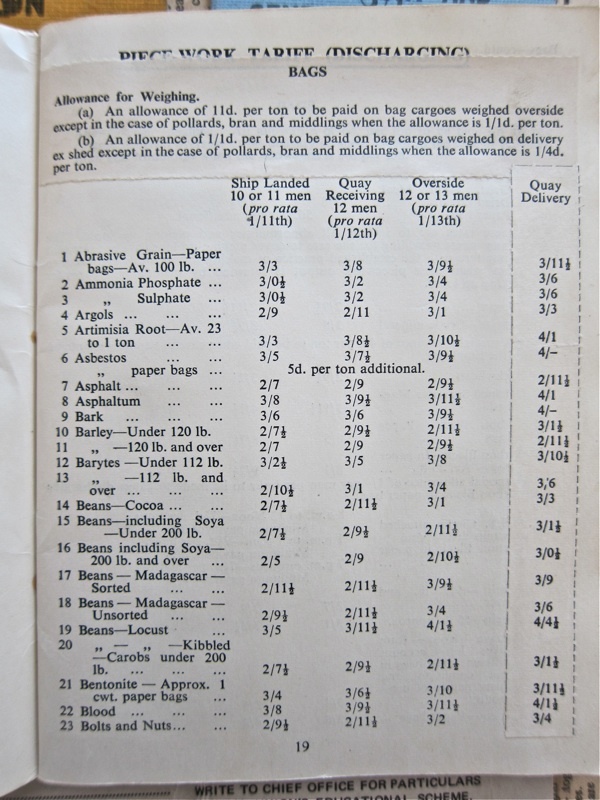 Note number six, the rate for unloading bags of Asbestos. Colin as a Shop Steward in 1976. 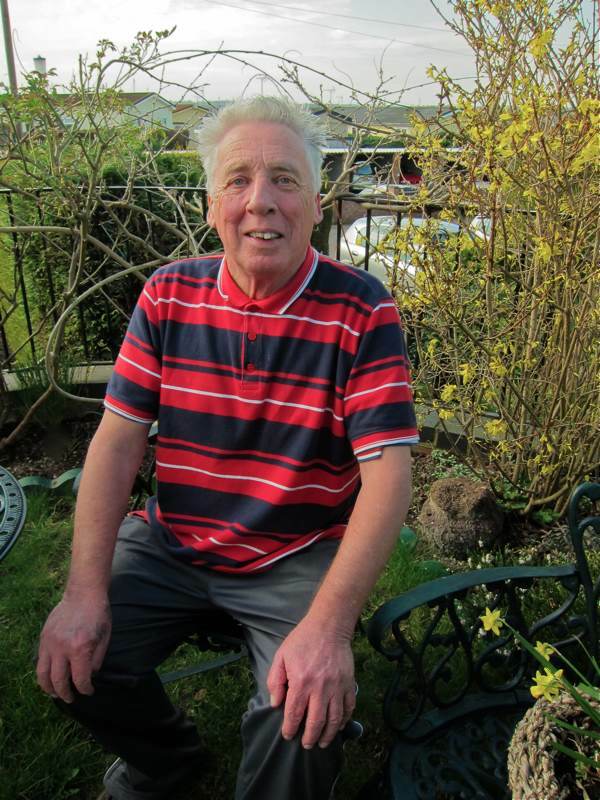 Colin Ross in his garden in Hullbridge. Thank you for this, Gentle Author. It was particularly poignant for me, as my grandfather was a docker and he died in 1933 as a result of injuries received at work. In those days there was no compensation at all and my grandmother had to raise her four children by earning money scrubbing other people’s floors. One family anecdote tells us that one winter they were so cold and so desperate that my grandmother broke up some of her wooden chairs to burn in the grate. An interesting post. My boyfriend is a fisherman down in Newhaven, near Brighton. Newhaven used to be a thriving little industrial town but since the 70s has been in decline, mainly due to the introduction of containerisation and the closure of the docks. Hundreds of men used to be employed on the docks and the railways that transported the goods from them. Now there are very few jobs, the town centre is an empty shell of boarded up shops, and drug addiction and other social problems are rife. So-called progress often seems to be at the expense of peoples’ livelihoods. I remember the end of the docks as a major employer in the East End. Partly because Jack Dash lived upstairs from us but also because many of my schoolfriends’ dads worked in the docks. 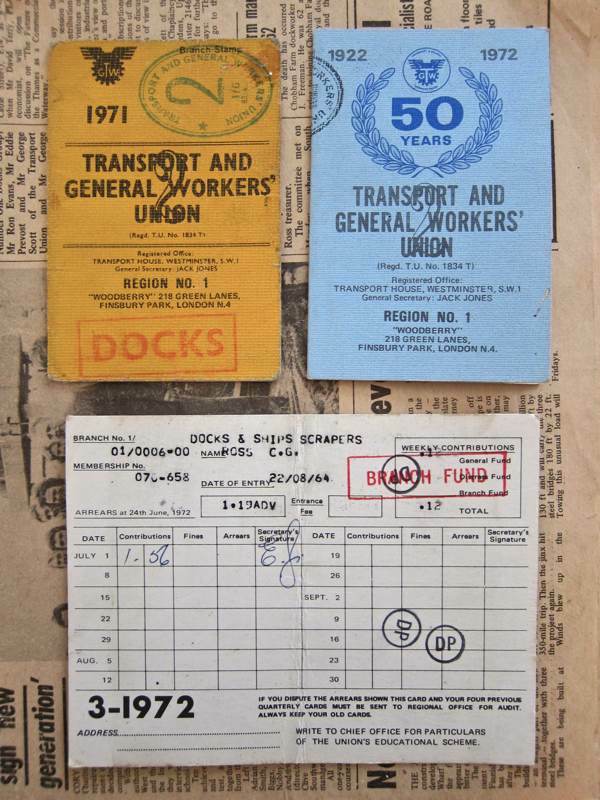 Being a child/teenager at the time what I remember most is the number of ex dockers who went on to do the Knowledge (the qualification scheme for becoming a black cab driver). It was a regular sight to see friends’ dads going around town on a motorbike with clipboard attached learning the various routes. Incidentally Harry Redknapp can be found reminiscing about the docks, containerisation and Jack Dash with Alan Sugar in the pages of the current issue of the Radio Times. I’ll be asking for Colin’s book for my birthday. I just stayed for half an hour longer at work to read this – what a wonderfully insightful article Mr Gentle Author…Lovely images too. My mothers father was a docker, his job was to unload red lead. The red lead was loose in the hold of the ship and my grandfather and another man had to stand in the hold on the lead and shovel it into crane buckets that were lowered in. As the buckets were raised the red lead used to blow off and cover them. No health and safety in those days. I am descended from London dockers. My family only stopped working in the docks when my great-grandfather was permenantly disabled in a fall down the hold. I have been a member of the TGWU (now Unite) for the past 9 years, and I am very interested in Jack Dash and in the docks more generally. I read Jack’s autobiography, and I was sufficiently impressed to consider inviting him to speak at one of our Branch meetings. Unfortunately, however, I found out that he had died some years ago. What are your memories of Jack Dash, Joan? People who knew him speak of a charismatic, warm and rounded character. Do let us know? Such a wonderful pieace, thank you. Mr. Ross is amazing, I loved reading about him. My Grandfather in Toronto, I am Canadian, dedicated his life to his union and the rights of working people. I believe in what he did, I admire what he did, however mostly I just miss him like crazy. It was such a joy to read about Mr. Ross, thank you. Hi Claire. He was a lovely man. He lived on the fifteenth floor when we lived on the thirteenth of Latham House in Stepney – one of the first tower blocks to be built. We moved in when I was six months and were rehoused when I was sixteen so I have many memories of Jack. Even my dad, who was a Catholic anti-Communist (quite a common figure in the electricians union to which he belonged) thought him a fine fellow. He was always very encouraging to me to get an education and ‘serve my class’ – I don’t think I would have got to university without the seed he planted in my head. Both the floor he lived on and our floor were spotless – people like Jack were very particular about that and special efforts were made when a bride (like my nineteen year old sister) was going to have to use the lift. I remember going, at his encouragement, to see some of his paintings displayed in the Whitechapel Art Gallery as part of the Whitechapel Open (and believe me going into an art gallery was not something that I would have thought to do). I was very lucky to know him and it’s a real shame that you didn’t get to invite him to a meeting. I have been searching ages for information on the dockers in the London docks during the 1960′s and you’re article has told me everything I need to know. Thankyou so much. I am writing a script about growing up in the East End then, and how ignorant I was of my dad’s struggles as a docker. In hindsight I can relate to everything you say. I now live in Norfolk where building work has taken place over the road. Neighbours have complained about the noise, but I love it as it reminds me of the clanking and banging in the docks, sounds I took for granted and all but forgotten, until now. Hello Colin as Ive said read your book. its not quit as it was the death of the docks began long before it got to the Royal group or the west India dock for that matter it started along the river side first with wharves and warehouses closing down I was a docker infactI was shop steward at the London cold store from where we organised the picket for the Midland cold store.Tony Merrick work from there also as you know he was one of the five but he was never a shop steward. London cold stores dockers picketed from day one of the struggle at the Midland until the arrest of our brothers Bernie Steer or Vic Turner was never seen on that line as I understand they wre at the Chobham farmsite also the five were not all shop stewards conny Clancy was just in wrong place at the wrong time and Watkins was not a shop steward either. Hi Colin, I tried to make contact with you when Vic Turner died earlier this year but with no success. It was a great turn out with plenty of old faces to be seen. The old Royal Group Banner led the hearse in. Get in touch if you can. Teddy Gates left the docks earlier and now lives in Italy. Freddie Roffe unfortunately died many years ago. Hi Colin this is a great article and all the comments are very intresting as well. My father was in the Royals as a Stevidore, and he died a couple of years ago of a asbestos related disease. Some of you may have known and worked with my dad i’d really like it if some of you would get in touch with me to see weather you remember him. His name is George Tilley from Custom House worked in the Royal’s from late 40′s 50′s then got moved to Tilbury and finished in the 80′s. Are you the same Colin Ross who used to live at David Street Stratford. Hammers were in the cup final. for wear, Oh they were good days. I CONSIDER IT A PRIVILLAGE TO SAY I WAS A SHOP STEWARD WITH YOU AT TOM WALLIS ,STEVERDORING ,IN ROYAL GROUP OF DOCKS, FOR MANY YEARS,BEFORE AND AFTER THE CONTAINERISATION CAMPAIGN. I had the privilege of going to sea with Colin on a round the world trip 13 months through google I have found him after 50 years quite amazing. I have just read his book it was fascinating like in life the press only print half truths. Really interesting article. I met Colin last week as I am running a schools history project to explore the history of the people who worked in the docks. He’s a lovely guy with an important and fascinating history. For our project we are recording the history of people who worked on the docks, getting them to come and meet small groups of primary school children in London to talk about their working lives. If there are any of you who worked on the docks who would like to get involved please have a look at our website and get in touch. Both my uncles worked at East India Docks. My uncles (twins) were George and Harry Redknapp. They were close friends of Jack Dash. My uncle George travelled the world as a Merchant Seaman. I have been to the Guildhall and traced my family back to 1700. They have very good records. The Museum of Docklands is a must to visit too.